Disney's Animal Kingdom "hatched" in 1998, the fourth Walt Disney World theme park, with its DNA an ambitious helix of conservation, animal appreciation, and thrill rides. Journalist Chuck Schmidt explores the genome of this "half-day park" that continues to expand and evolve. With contributions from Disney Imagineers instrumental in the design and construction of Animal Kingdom, including Kevin Rafferty, Zofia Kostyrko (who wrote the foreword), Joe Rohde, and Marty Sklar, as well as zoologist Rick Barongi and horticulturalist Paul Comstock, among others, Schmidt's book is the definitive guide to Disney's wildest theme park. Beginning with Walt Disney's original idea to use live animals for Disneyland's Jungle Cruise, and Michael Eisner's determination decades later to build "nahtazu" ("not a zoo"), the story of Animal Kingdom is told on all levels: from the visionaries and concept planners to the scientists, engineers, and cast members who turned dreams into red-blooded reality. 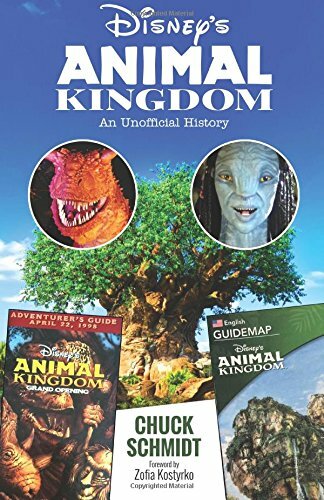 In addition, the book includes separate chapters for each "land" of the Animal Kingdom, including the newest land, Pandora, as well as coverage of the Animal Kingdom Lodge.